This is yet another example of a new standard SECR wagon design produced by Richard Maunsell (later to become CME of the SR) and his ex-Swindon Chief Draughtsman, Lionel Lynes. 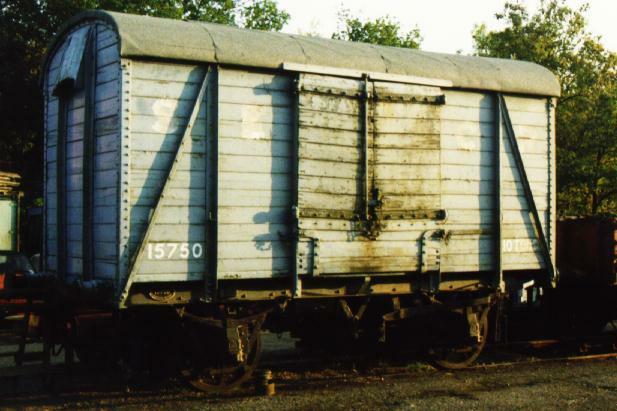 A "pattern" or prototype covered goods van of 12 tons capacity was put into service in July 1915. Further examples were built from 1918, with the SR continuing to build vans to this design until 1926. 15750 is one of a lot of 50 built between February and April 1919 at the SECR's Ashford (Kent) Works. It had a tare (unladen) weight of 6 tons 17cwt. After the Grouping it became SR No.45767 and continued in service, carrying general merchandise, until it was withdrawn from traffic by BR in May 1958 as S 45767. The van was transferred to Internal Use on 17th May 1958 and allocated the number 080697. It was used for static storage, first at Redhill, then at Streatham Common where there was a large goods yard. There were at least 11 sidings in this yard and railway delivery lorries operated from there. On 1st January 1969 the local delivery of goods carried by rail was transferred to the National Freight Corporation, continuing to operate under the name National Carriers Limited. NCL had the use of 080697, together with coach 4441, which was used as an office. Eventually the van was purchased from Streatham Common and arrived at Bluebell on 29th September 1973. 4441 followed shortly afterwards. Sometimes paperwork and information used to take some time to work through the BR "system", particularly in situations of changed ownership; consequently the van was not finally shown as sold until 5th March 1976! 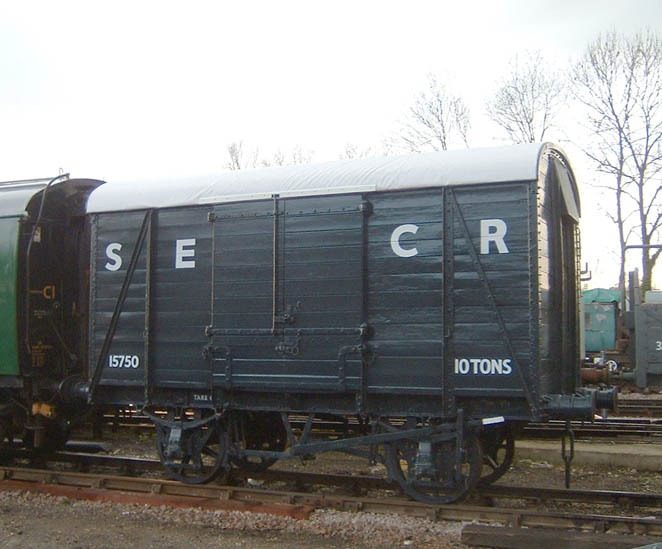 This SECR goods van was given an overhaul a few years ago, which included the fitting of new doors and the replacement of several rotten body-side planks. Then in early 2004 it was given a new roof covering and repainted again, as seen in the above photo. The photo below shows it before overhaul. An Illustrated History of Southern Wagons - Volume Three, by Messrs. Bixley, Blackburn, Chorley and King; published by The Oxford Publishing Company, 2000. ISBN 086093 4934. This book may be available from the Bluebell Railway shop. Text © Martin Skrzetuszewski and Richard Salmon, with additional research by Ted Crawforth.